Peter Pan tickets on sale now!!! 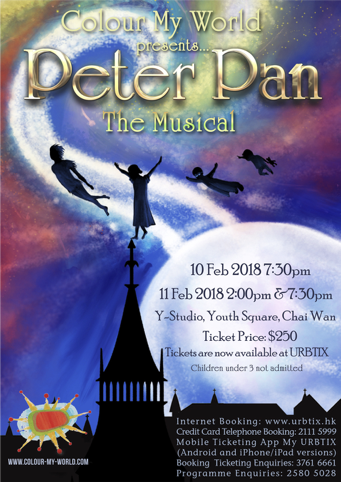 Peter Pan tickets are on sale now at all Urbtix outlets and online at: www.urbtix.hk. For credit card telephone bookings please call 2111-5999. You can also grab tickets through the Urbtix mobile ticketing app, My URBTIX on Android, iPhone, and iPad. Grab your tickets early for the show you want! You don’t want to miss to miss it! See you February 10 -11, 2018 at 7:30pm or catch the matinee on February 11, 2018 at 2:00pm.